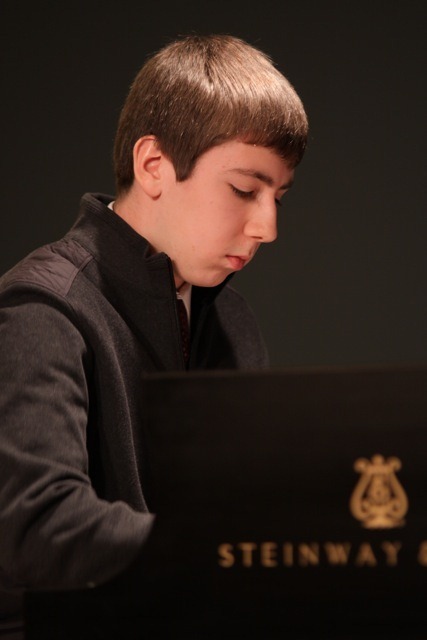 On Sunday, Jan. 30, Donald Rask was one of only three teenage piano students from the Milwaukee area to take part in the Milwaukee Music Teachers Association Youth Concert. He earned his position in the program by passing a citywide audition held in 2010. Donnie’s talents are familiar to Milwaukee’s Armenian community. He serves as a tbir (acolyte) at St. John the Baptist Armenian Church, occasionally fills in on organ during the liturgy and has performed on piano at events in the church’s Culture Hall. A sophomore at Oak Creek High School, Donnie is a member of the marching band, symphonic band and jazz band as well as a pianist in the pit orchestra for school musicals. A multi-talented instrumentalist, Donnie also plays French horn and trumpet. For the Sunday afternoon Youth Concert at the Steinway Piano Gallery, Donnie performed Beethoven’s Sonata in C minor Op. 10, Scarlatti’s Sonata in A major, Mendelssohn’s Duet Op. 38 and Sibelius’ Romance. Seated behind the shiny grand piano with a look of gracefully focused concentration, Donnie executed the challenging works of music with ease. His fingers climbed with great agility across the peaks and valleys of great compositions from Europe’s Romantic Era. Donnie allowed himself a smile of triumph as he bowed before the applauding audience.